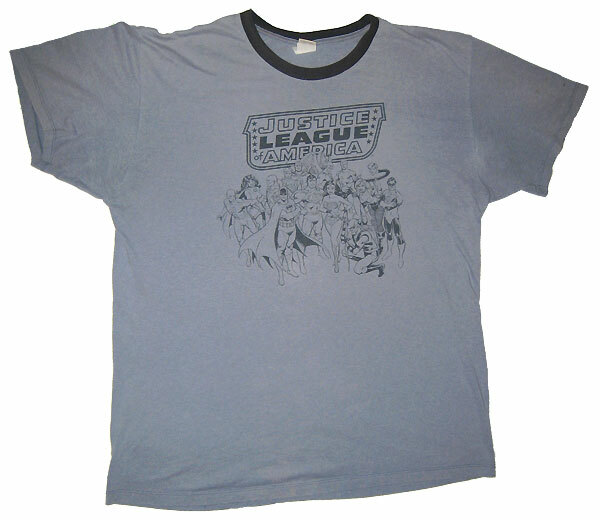 Since I posted my JLA t-shirt featuring Firestorm two weeks ago, I’ve come across several other shirts worth looking at. Today we’ll focus on the JLA-related ones, but tomorrow come back for a special t-shirt that I’m very excited about. 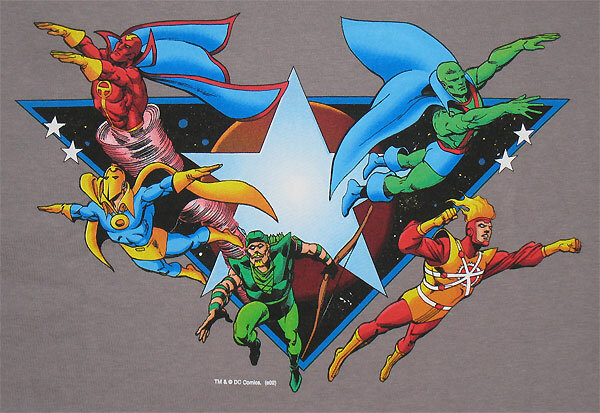 Here is a nice shirt I just got featuring an unusual collection of characters: Red Tornado, Doctor Fate, Green Arrow, Martian Manhunter, and everybody’s favorite Nuclear Man. Near as I can figure, the artwork on this shirt must have been produced in conjunction with the second wave of Super Powers action figures. These happen to be the exact five superheroes that were released in that wave. Otherwise, I can’t think of a time these particular heroes were together for an image like this. 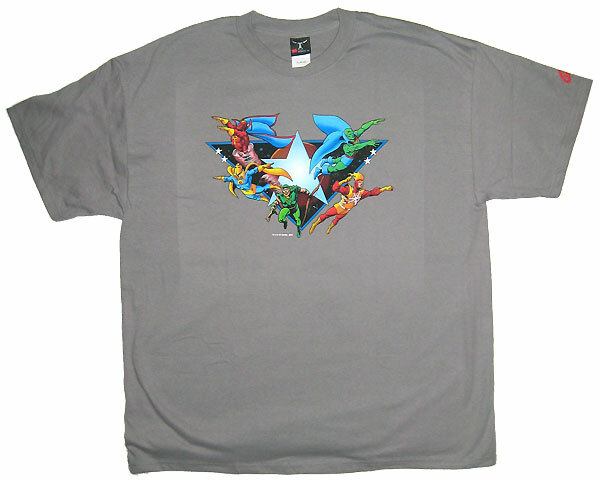 You can order yourself one of these great-looking shirts from Graphitti Designs by clicking here. Here is a close-up of the graphic. I’m not 100% confident on the artist, but after doing some research and consulting with experts we believe this image is most likely a Jim Starlin drawing. I love the clean lines on Firestorm. Really sharp. And I get Doctor Fate on the same shirt! Yay! If you like Doctor Fate, be sure to check out today’s post at ONCE UPON A GEEK. My friend Terry was kind enough to loan me this next shirt so I could photograph it for FIRESTORM FAN. 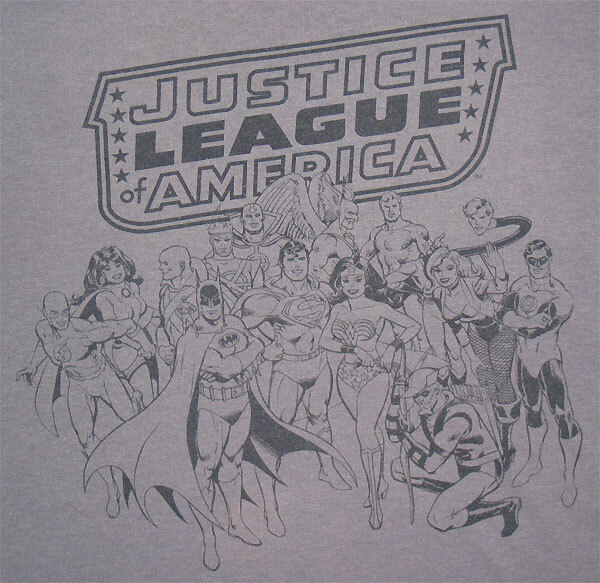 It’s a really cool slate-blue ringer t-shirt featuring the satellite-era Justice League of America. Here is a close-up of the graphic. You can see Firestorm directly under the “M” in “America”. Unfortunately for the logo, it appears to be seconds away from bursting into flames thanks to our favorite match-head. The artwork on this shirt was done by Jose Luis Garcia-Lopez, the man who did much of the DC promotional stock art back in the early 1980s. My thanks to Terry for the loan! I don’t own the next three shirts, but I’ve found them for sale online recently. 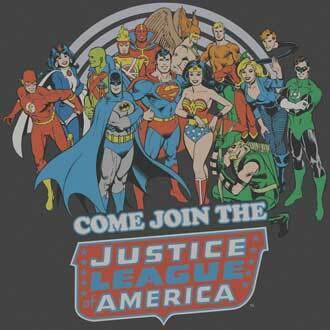 This next one features the same image as above, but this time in color and with the slogan, “Come Join the Justice League of America”. Thankfully, Firestorm’s hair isn’t setting anything on fire this time. You can order this shirt from Popfunk.com by clicking here. 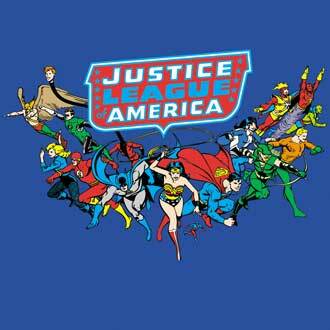 This next shirt features the Justice League of America racing into action. Firestorm can be found flying on the right-hand side of the group. The artist on this shirt is most likely Jose Luis Garcia-Lopez again. You can order this shirt from Popfunk.com by clicking here. 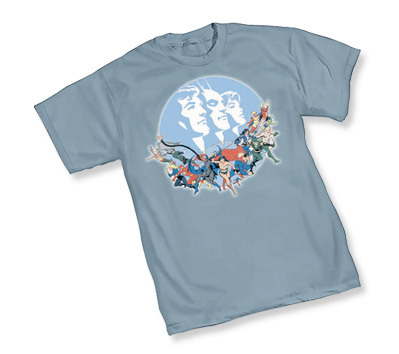 This last shirt features the same image of the JLA as above, but with the trinity in the background. Personally, I like the look of this shirt better. You can order this shirt from Graphitti Designs by clicking here. Remember, come back here tomorrow for one more t-shirt! Posted in: Apparel, Firestorm #01: Original (Ronnie/Martin), Justice League of America, Super Powers Collection. I like the “Come Join The JLA” one–cool slogan! And interesting reasoning behind the line-up of the first shirt…that makes sense, doesn’t it? I have the ringer shirt and it is really nice. The color is muted, but it doesn’t hamper the linework, which remains easy to see and very clear. That is the only comic book shirt I own which my wife will wear (and has worn on more than one occassion, actually). oo very cool, i have friends that will want to scarf these up immediately. thanks! Frank – Who knows, you may be right. I’m not that great at eyeballing artists, but the Jim Starlin suggestion came from someone with a real eye for this kind of thing. Regardless, it’s a great shirt! I’m thrilled to own it! Such an unusual group of characters. These are some cool shirts. The top one is art from the DC style guide that came out in the late 80’s. There’s also two more pictures in there that include just these 5 characters, but this one is the best.